We are absolutely thrilled to announce the launch of a new venture - Linlithgow Literary Lunches! Far From The Madding Crowd have teamed up with Granary Café to bring you the best in food and books, so keep the first Monday of the month free! Each month we will bring an author to Linlithgow to enjoy a relaxed literary lunch in style at the excellent Granary Café. The ticket price will include lunch and soft drinks, plus a discount off the price of the book on the day. 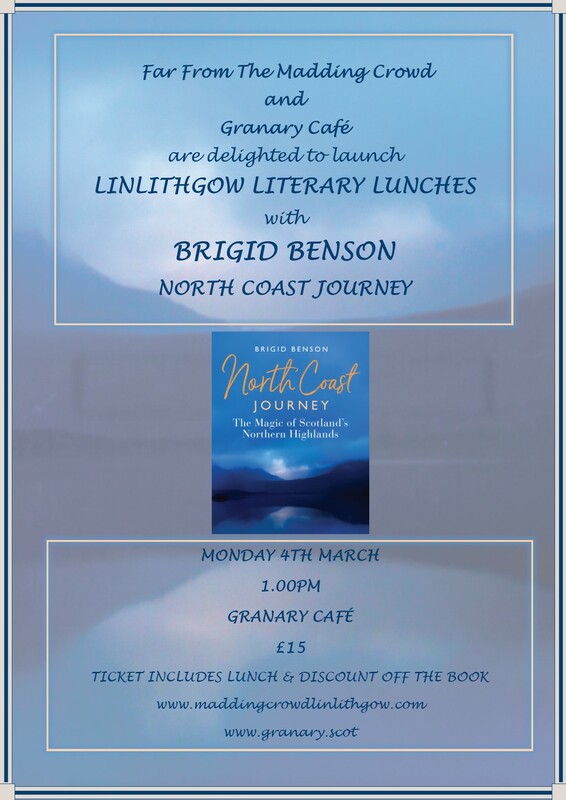 The first lunch will take place on Monday 4th March at 1pm with author and travel writer Brigid Benson. Brigid's most recent book is North Coast Journey, the essential guide to the North of Scotland, following the North Coast 500 route. Spaces are limited for the literary lunches, so please book early to avoid disappointment! AND OF COURSE YOU CAN POP INTO THE SHOP TO BUY YOUR TICKETS DIRECT FROM US!